The road coming south out of Rhayader is open again. The last 3 days have been very difficult for our visitors but a surprising number of folk have managed to get here despite the road closed signs beginning some 13 miles out from here. The kites are now coming in very quickly with a few taking food as I put out the first shovel full of meat. I had made things more difficult for myself here a couple of days ago as I bought diesel instead of petrol for the generator that runs our 3 phase meat chopper.. This led to my having to cut up meat by hand today, but I should have the generator back in place tomorrow following out local garage sorting out this home made problem.. I'll be more careful in future! Red Kites, and Road Works! 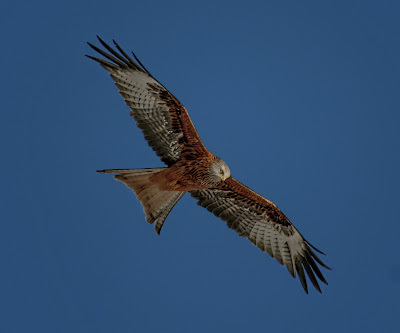 Red kites are increasing in numbers by the day but coming to see them has been become a trial for many motorists this week..
BT have contractors are digging up the road in Rhayader. This cuts us off from the town but is not the worst of the story as a mile and a half down the A470 those approaching from the South are confronted by a sign "ROAD CLOSED". No! It is only closed in Rhayader! So how to reach us. Coming from the North or East. About 3 miles east of Rhayader on the A44 is a road going off to the right to Nant Glas. This will take you across to the A470. Turn left onto the main road and follow for 2.5 miles, ignoring the road Closed sign. If coming from the south A470, when 1.5 miles from Gigrin you will see the Road Closed sign. Ignore it, as both Brynafon Country House, and The Red Kite Feeding Station are reached 1/4 mile before the road is actually blocked. If we had had notice of this work things would have been very different but as it is we have to do what we can to mitigate the problem. 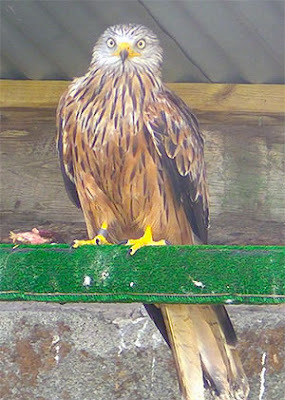 Red Kite Numbers Climb + News from the Rehab Centre. 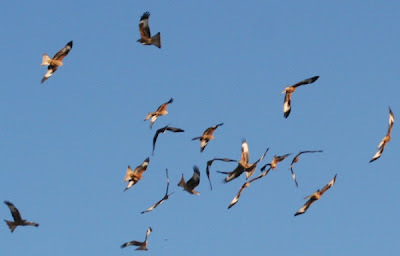 The numbers of red kites descending for food has begun to rise as autumn beckons. The past three days have seen them arriving on time too, which is both good news for all our visitors, and my ever climbing stress levels. Its the first time I can remember that the WTB have recognised what the Gigrin Farm does for Mid-Wales. Not only do the red kites benefit from the 'top up' that has been made available to them each and every day of the year for the past 16 years, but the hotels, pubs, b&bs, fuel stations, etc., etc., all have more folk through their doors. The results of the filming are, I have been told, to be made available in the future on a WTB DVD to promote Wales. The beautiful bird on the right is over 20 years old, and is now able to fly figure of eights around the rehabilitation centre. This kite will be re-joining its comrades in the not too distant future. It should be noted that a red kite of this vintage will be found nowhere else in the UK. The immature red kite (no. 63), that was a resident of the rehabilitation centre for the past few weeks, was released on Monday. An update on this birds progress will be here in the not too distant future. The last 30 days have been torturous in the extreme as the kites have had such an unreliable time table. The worst day so far, thursday 6th August, it was 5:30 when the kites came down for food. That was a very warm and sunny day. Since then, timings have been anywhere from 3pm on the dot, on cool days, to todays 5:15 in the pouring rain. August is a particularly awkward month as the rooks that are normally ready to fly in for a meal at any opportunity have instead been to the the hills for the hatching of grubs. This has left nervous carrion crows and ravens on patrol and neither of these birds have been eager to be first to land on the meat. 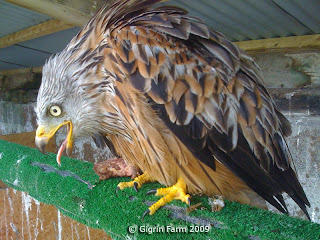 The red kites are then of a mind that the meat will be 'safe' no matter how long they stay aloft. Today it was the rain that started quite lightly at lunch time, but gained strength as the afternoon unfolded, until shortly after I'd put out the food it lashed down and drove everything into the trees. It only brightened just after 5pm and 10 minutes later kites and ravens were themselves pouring in for food. Tony Cross brought in a new patient - a 20yr old red kite! This has to be the oldest inhabitant of the rehabilitation units to date. This kite is a bit of mystery as no injuries have been found, and it eats its rations, but will not fly. No. 63 has come on well and now stands on both feet, flys the length of the rehab unit, and if anything is now a little too heavy since regaining its appetite.